Home Reviews	Is Monster Hunter Stories a Good Choice for the Casual Gamer? Our Demo Review. Capcom recently released a free demo of their upcoming Monster Hunter Stories game for the 3DS. After playing it over the last few days, I have to say I’m impressed with what I’ve seen so far. The company has truly taken inspiration from their previous Monster Hunter games and made something that’s more relatable to the casual gamer as well as those brand new to the series. The game focuses on the concept of being a Rider. A Rider is someone who forms a special bond (via a Power Stone) with a monster and can use its help to defeat dangerous creatures all over the land. The monster a Rider forms a best friendship with is called a Monstie. Riders obtain Monsties by hatching eggs. The more eggs you hatch, the more Monsties you have to choose from not only when in battle, but also as a mode of transportation in your explorations. Unlike other Monster Hunter games, MHS isn’t based on the physical maneuvering of your character, but uses a more strategic, RPG, turn based style of battle instead. If, like me, you’re new to strategy games (Or RPG’s), don’t let this intimidate you, because battling an enemy is quite simple to manage and easy to understand. You start off with 3 basic types of attacks; speed, technical, and power. Each of these has their own pros and cons and it’s up to you to decide what will work best in each fight. To help in your decision-making process, you’ll need to learn the types of moves that each opponent makes. This is easy for the low-level enemies which use the same 1 or 2 attacks every time. You will have a small learning curve for the higher-level enemies that sport 3 or 4 different types of hits, but even they can easily be defeated once you learn the pattern to their routine. On occasion, you’ll also have the use of a Kinship Skill attack which allows you to mount your Monstie in battle and serve a multiple damage wallop to your opponent. This can only be used once in a fight and is easily performed with the push of a couple of buttons, when the game prompts you that it’s available. As you progress through the game (demo), collecting items, finding eggs/hatching new Monsties, fighting monsters, fulfilling challenges and subquests, and earning recipes to combine things you’ve found/earned, you’ll have many more choices of things that will help you in battle, beyond just the basic 3 attacks (and basic herbs for healing). Although this makes determining what’s best to use a little more complicated, it also keeps the game interesting as you have many more options from which to strategize. Once you’ve successfully completed a fight, you’ll receive a grade that tells you how you did. Anticipating what your score will be is as nail bitingly fun as awaiting a CORRECT (and a smile) after solving a problem in Professor Layton. If you get a low score, don’t fret. (I spent 3/4 of the demo averaging at a C). Each time you defeat a monster (no matter what your score), you’re still gaining rewards, upping your EXP, gaining zenny (currency) for purchases, and making overall forward progress. It’s impossible to get lost in MHS because you always have a map to guide you in your travels. It shows your current location, which direction you’re moving in, and a marker for where to go next. Along with this, you’re accompanied by a cat named Navi who will always keep you on track. Collecting items that can be used for healing, eating, feeding your Monstie, upgrading weapons and armor, and much more, is a huge part of the game. Along with this, learning what items are and aren’t of worth is also crucial to your success. Whenever you have items you want to get rid of, you can sell them for zenny to a Merchant or Smith. You can also purchase items from either, depending on what it is that you need. The Merchant carries a range of inventory items from ordinary to rare. The Smith sells brand new armor and weapons as well as upgrades for the gear you currently own. Challenges and Subquests (side quests) are also a big part of what you do in the game. Challenges help forward the storyline and give you the chance to learn needed skillsets like hunting eggs in monster dens and combining items (with a recipe) to make a powerful potion. Subquests consists of favors the villagers ask you to do in exchange for various types of rewards. Sometimes they tie-in to your everyday grinding like finding a certain amount of Earth crystals or showing someone the Monstie eggs you’ve found. At other times, they’re nice little distractions from the norm like catching Sushifish or rescuing lost Poogies (cute pigs). Is it Monster Hunter Stories Right for the Casual Player? The game is hugely fun to explore. You can collect to your heart’s content. Items are easy to acquire, as they are everywhere and can be obtained while still atop your Monstie. The battle system is straightforward. You can play at your own pace. It’s easy to level up. Stealing eggs from Monster Dens (and then finding out what’s inside) is addictively fun. Completing subquests is fulfilling (and an easy way to level up & gain items). No matter how bad a sense of direction you have, you will not get lost. A map is always present on the bottom screen, showing you where you are and where you’re going. If you’re ever uncertain about what your next goal is in the game, you have professional Rider, Dan, and your companion cat, Navi, to help you figure it out. There’s a large amount of monsters in the wild which gives you ample opportunity to get better at battling. You can avoid the monsters in the wild when fighting isn’t your goal. After completing the demo, you’ll have the ability to fast travel from place to place. (It will just take some time to open up all of the umbrella stands so you can travel anywhere). You have the ability to switch out your Monstie sidekick during battle which helps if your current Monstie is running low on EXP (and you don’t want to have to heal him) or you see that he isn’t getting the job done against your opponent. If you enjoy competition, you’ll be able to match-up your Monsties against those of other players in the full-length game. (It wasn’t available in the demo). Constantly earning new moves, gear, Monsties, potions, and other useful items as you continue to play keeps the game exciting and ever evolving. If you love to analyze and strategize, this is the game for you. Although the battle system is not hard to understand, fighting does become more complex as you gain new moves and choices of armor/weapons. There’s a lot to learn, especially if you’ve never played a Monster Hunter (or strategy/RPG) game before. Having so many choices of things you can do, buy, sell, collect, upgrade, combine, and use in battle can be daunting. This is not a game you can quickly beat in 10 or less hours. The grading system on your fights can be discouraging until you learn what you’re doing and start improving. On occasion, the challenges can be a bit vague, not giving a definitive goal of what to do next. The massive amount of enemy monsters in the wild can be frustrating if you just need to get somewhere fast or want to collect items without having to fight. 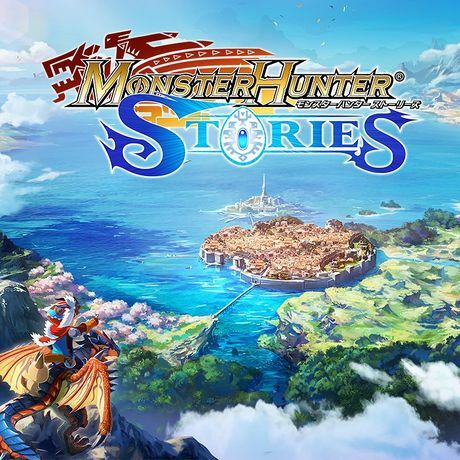 I do recommend Monster Hunter Stories to casual players, especially those looking for a fun adventure game that doesn’t require physicality or platforming. Although there is a fair amount to learn, especially if you’re new to RPG’s or strategy games, at the end of the day, MHS is still a play and level up at your own pace, thinking man’s game. I very much look forward to continuing my monster hunting exploits when the game releases on September 8th. I’m also excited that I can import my demo game save so I can start back where I left off. Still uncertain if this game is for you? Download and play the free demo. It’s available now on the Nintendo eShop.